Ugh. I’ve had too much chocolate. I’m writing this on Easter Sunday, surrounded by temptation in the form of several variations and combinations of chocolate, as is customary in the Western world at this time of year. It turns out you can have too much of a good thing – real ‘first world problems’. Talking of #firstworldproblems, chocolate addiction really is an issue for the developed world, where chocolate consumption is at its highest in this part of world – maps bear this out. So given this time of year, I thought it would be fitting to look into the geographical patterns of chocolate consumption and production, and the following maps, whilst maybe not surprising, they perhaps do reveal something deeper about economics and environment. Whilst I gorged myself too much on chocolate over the Easter weekend, I am at least in good company. Although Easter, and other special occasions like Christmas, Valentine’s Day, and birthdays are peak times for chocolate consumption, it is estimated that 7 kilograms of chocolate are consumed by each British person over a year. 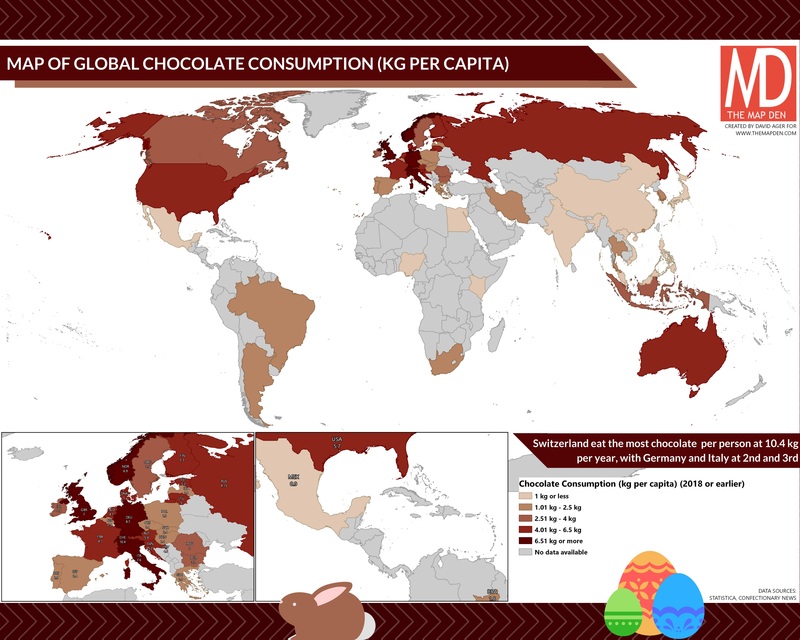 However, as you can see in the above map, while the UK is one of the top consumers of chocolate, it is in good geographical company as Europe, as well as North America and Australia have a relatively high chocolate consumption, compared to other parts of the world, such as Asia and Africa. Neither is the UK the highest consumer of chocolate – this title goes to Switzerland, consuming 10.4 kilograms per capita a year. This is not surprising however, given Switzerland (and Belgium’s) strong reputation as a high global exporter of chocolate and renowned tradition of chocolate manufacture with chocolatiers such as Lindt, Frey or Tobler (think Toblerone), which have been in operation for over 100 years. While Belgian consumption is relatively lower and has reduced over time, the inventors of praline, also still hold a high reputation and power in the chocolate industry. Indeed, if you ever visit picturesque Brugge (West-Vlaanderen, Belgium), I’d highly recommend visiting Choco-Story, the best chocolate museum I’ve ever visited (admittedly it’s the only one I’ve been to!). The irony of this map of chocolate consumption is that, while places such as Brazil and Indonesia do eat a reasonable amount of chocolate, the areas of the globe where cocoa beans are grown and harvested, consume a relatively low amount of chocolate compared to Europe. 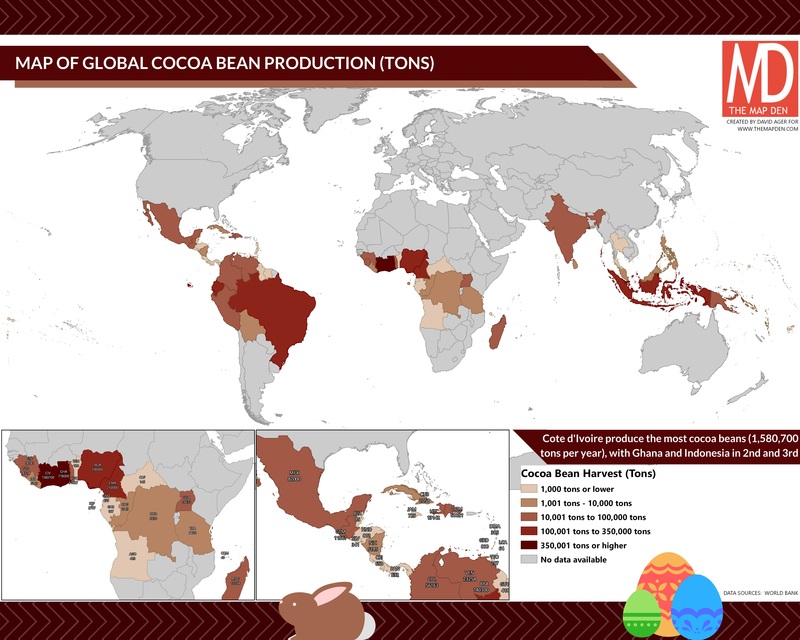 As you can see in the below map of cocoa bean harvesting, it reveals a strong climatic pattern for where it is grown – in and around the equator and the tropics (no further north than Mexico and no further south than Madagascar). While Central America and the Caribbean, South America (Brazil and Ecuador particular), and Indonesia have strong cocoa bean industries, West Africa are the dominant producers/providers of cocoa beans with Côte d’Ivoire producing over a staggering 1.5 million tons of beans. But why such a disparity between areas of production and consumption? The above video about cocoa farmers in Côte d’Ivoire, including tasting chocolate for the first time, is very revealing as to reasons behind this pattern. Chocolate is arguably a luxury product, and despite farming the raw product which is transformed into chocolate, workers aren’t paid enough, or arguably fairly, to afford such luxuries. Therefore, these geographical patterns reveal something deeper than just chocolate, that is the common divide between the economically ‘developed’ and ‘deprived’ world. Furthermore, the patterns of neo-colonialism can be seen here – while Central American or West African countries may be independent today – products are grown, harvested and exported from here to the benefit of the ‘developed’ world, particularly Europe; whereas the source of these products receive little benefit, particularly the workers. To give some background, chocolate was first brought to Europe by the Spain, who whilst colonising, discovered a Mesoamerican culture who drank it as a bitter but empowering drink, now known as ‘Chilate’ in Southern Mexico. Previous to European discovery, cocoa beans in Aztec culture were used as currency and took on religious importance. It was Europeans who added sugar to this (hence the surprise of sweetness to cocoa workers in the video), which helped launch the popularity of chocolate in Europe where it was manufactured by chocolatiers to cater for European markets. This colonial era of source-to-market, is reflected in its geography today. Climate is a factor of course as to where cocoa beans are farmed – these areas are the only places where cocoa beans can realistically be grown. Cultural traditions of chocolate are an influence too; the tradition of chocolate in Europe and North America are much stronger than in parts of Asia. However, the need of a fair price for farmers of cocoa has been a driver behind important campaigns such as Fairtrade. Patterns of consumption are more likely to change over time, but for the moment, chocolate is arguably symptomatic of ‘third world problems’. Maps and topics of luxury, as well as many goods, can reveal much about economic, political and social geography around the world, as well the old ‘core-periphery’ geographical model. I’m trying not too feel too guilty about my chocolate consumption, or you for that matter – this wasn’t the aim of the article. At the end of the day, we cannot be responsible as individuals as to where we are born and the patterns of history and economics. But maybe we can try our best to think and be aware of such issues as to how the world is how it is – and then take small little actions as individuals to help make the world a fairer, sweeter place. Next Post: Eurovision 2018 – Do you need good neighbours?